The new Officine Panerai Luminor 1950 Regatta 3 Days Chrono Flyback Titanio, presented during the SIHH 2013, is a chronograph with an automatic movement and a three-day power reserve, fitted with the Regatta countdown function, specifically created for yacht racing starts. 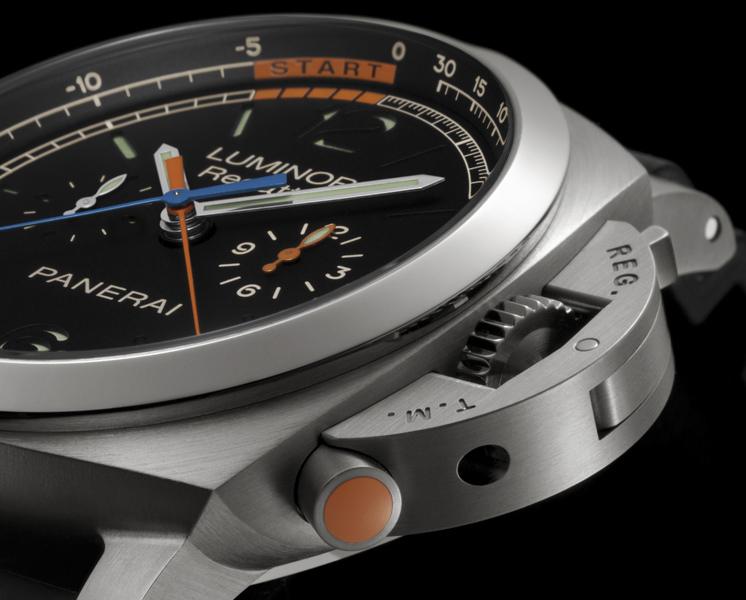 An orange push-button at 4 o’clock moves the central orange chronograph minute hand back one minute at a time, until it is at the correct position in relation to the length of the Regatta countdown. On starting the chronograph, by pushing the chronograph stop/start button at 10 o’clock, the relative hands begin to move, indicating first the minutes and seconds which remain until the start, and then, when the countdown has finished, the time elapsed since the start of the race. 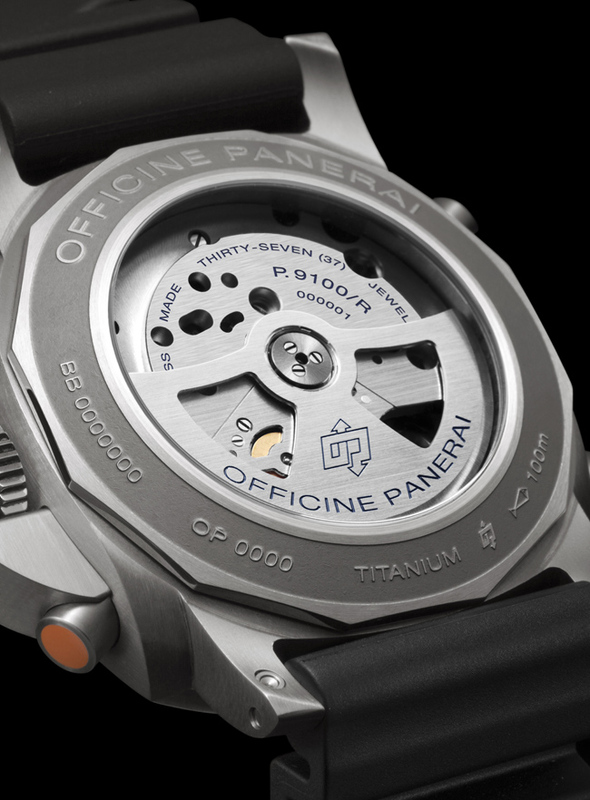 The push-button at 8 o’clock ends the time measurement, returning all the chronograph hands to zero. Alternatively, if it is operated while the hands are still moving, it activates the return-to-zero (flyback) function of these hands, thus enabling a new time interval to be measured immediately without having to operate the stop and reset buttons. 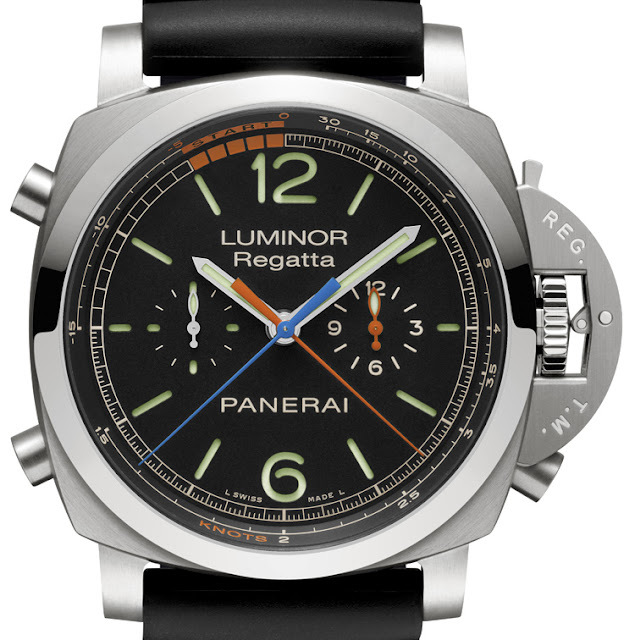 The black dial of the Luminor 1950 Regatta 3 Days Chrono Flyback Titanio has the sandwich structure and the classic Panerai design distinguished by the large linear hour markers and figures, enriched by the elements enabling the indications of the chronograph functions to be read. The chronograph hands are central and distinguished from each other by different colours, while the orange hand of the hours rotates within the small dial at three o’clock, mirroring the small seconds dial at 9 o’clock. The flange carries not only the scale of up to 15 minutes for the countdown to the start, with the five final minutes picked out in orange, but also the tachymeter scale expressed in knots which enable the speed of the yacht to be measured over a defined distance. The Luminor 1950 case is 47 mm in diameter and it is made of brushed titanium, a material which is light, strong and non-allergenic, contrasting with the polished bezel. On the back, a wide sapphire crystal window reveals the anti-shock P.9100/R movement, with its rotor which winds the springs of the two barrels while oscillating in both directions, providing a power reserve of three days. 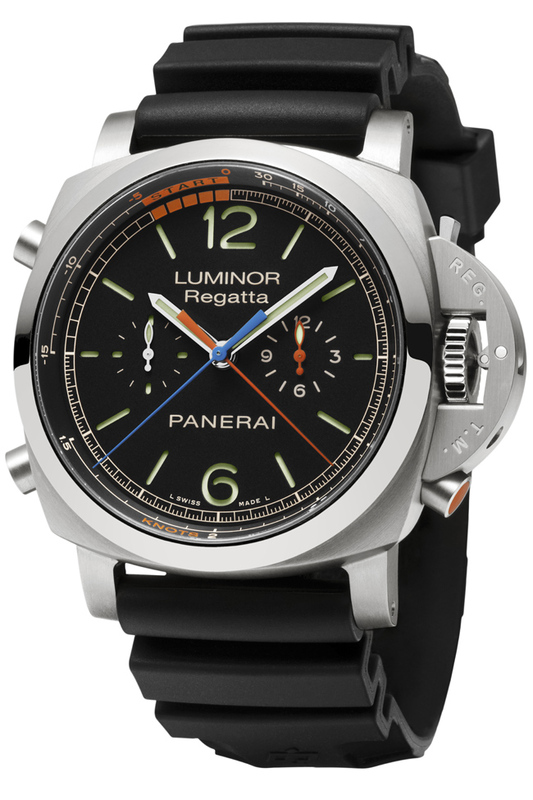 Water-resistant to 10 bar (about 100 metres), as is to be expected of a professional sailing instrument, the Luminor 1950 Regatta 3 Days Chrono Flyback Titanio (PAM00526) is part of the Contemporary Collection and it is supplied with a rubber strap as well as a second interchangeable strap, a tool for changing the strap and a steel screwdriver.